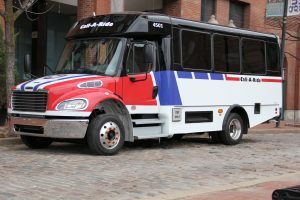 Metro transit is replacing older models of its 120-van Metro Call-A-Ride fleet with 37 new vans that will improve the overall transit experience for Metro customers. The new Metro Call-A-Ride vans were manufactured by Champion Bus and built on a Freightliner chassis, which offers a sharper turning radius, larger cab space and better visibility. 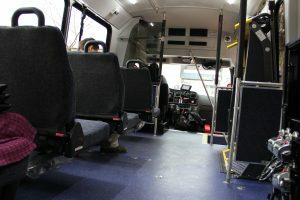 The vans accommodate a seating capacity of 14, like the older models they are replacing, but feature a wheelchair lift positioned in the middle of the van instead of the rear and a forward-seating area for wheelchair passengers, both of which provide a better quality ride. T he Federal Transit Administration requires about five years of service or about 150,000 miles traveled before we are allowed to retire the vans used for our paratransit operations. The Metro Call-A-Ride vans being replaced are 2003-2004 models with more than 400,000 miles on the odometer. The 37 new Metro Call-A-Ride vans are the first installment of a contract that will replace 68 additional vans over the next five years. I like Freightliner. But someone was rough with the seatbelts. I like the blue floor and with the lift being up front rather than in the back.